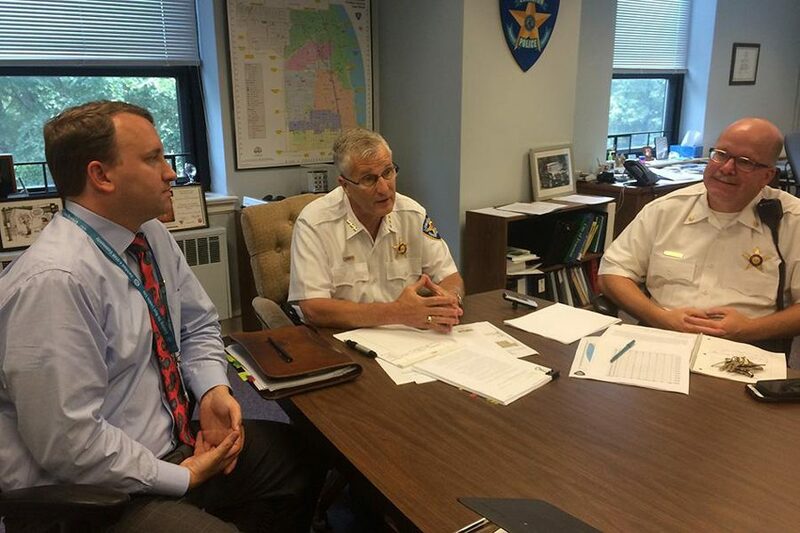 (From left) City corporation counsel Grant Farrar, Evanston police chief Richard Eddington and Cmdr. Joseph Dugan discuss a court case. Farrar submitted his resignation and will leave the city staff in April. Evanston’s corporation counsel Grant Farrar has submitted his resignation and will leave his position April 6, according to a news release from city manager Wally Bobkiewicz. Farrar will join GovHR USA, a firm run by former Evanston human resources director Joellen Earl and her partner Heidi Voorhees. “Grant has done an outstanding job as corporation counsel reorganizing the law department (and) guiding the city though many challenging cases,” Bobkiewicz said in the release. Bobkiewicz also said Farrar played an important role in helping dissolve Evanston Township. The township provided general assistance for residents and tax advice for residents, and in 2014, voters elected to dissolve the township at an annual meeting.